Download "Pricing with Perfect Competition. Business Economics Advanced Pricing Strategies. Pricing with Market Power. 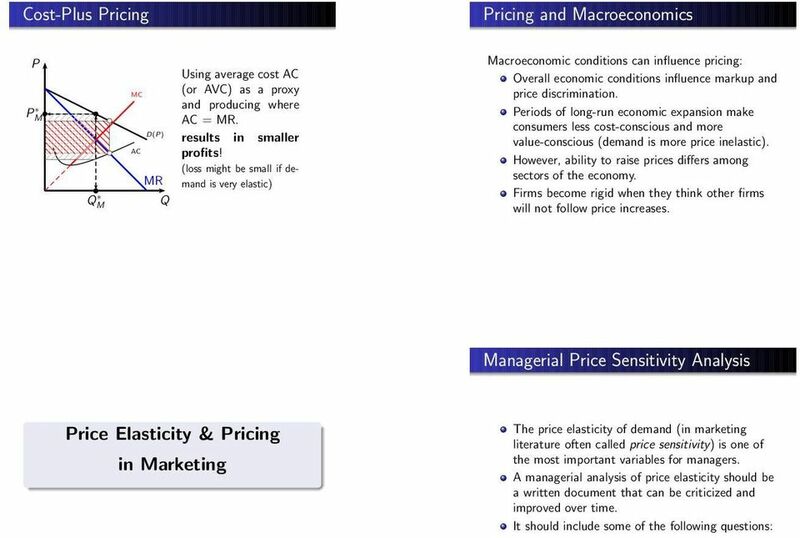 Markup Pricing"
1 Business Economics Advanced Pricing Strategies Thomas & Maurice, Chapter 12 Herbert Stocker Institute of International Studies University of Ramkhamhaeng & Department of Economics University of Innsbruck Pricing with Perfect Competition Perfect Competition: Pricing without market power (perfect competition) is determined by market supply and demand. Every supplier perceives demand for his own product as perfectly elastic. Therefore, he has to accept market prices as they are, he is a price-taker. The individual producer must be able to forecast the market and then concentrate on managing production (cost) to maximize profits. On perfectly competitive markets you will rarely see advertisement. Why? 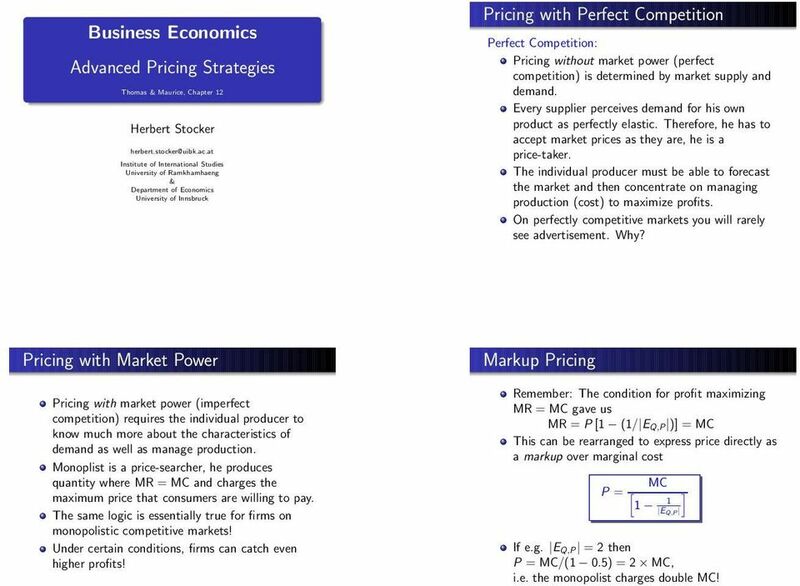 Pricing with Market Power Pricing with market power (imperfect competition) requires the individual producer to know much more about the characteristics of demand as well as manage production. Monoplist is a price-searcher, he produces quantity where MR = and charges the maximum price that consumers are willing to pay. The same logic is essentially true for firms on monopolistic competitive markets! Under certain conditions, firms can catch even higher profits! Markup Pricing Remember: The condition for profit maximizing MR = gave us MR = P[1 (1/ EQ,P )] = This can be rearranged to express price directly as a markup over marginal cost P = [ ] 1 1 EQ,P If e.g. EQ,P = 2 then P = /(1 0.5) = 2, i.e. the monopolist charges double! 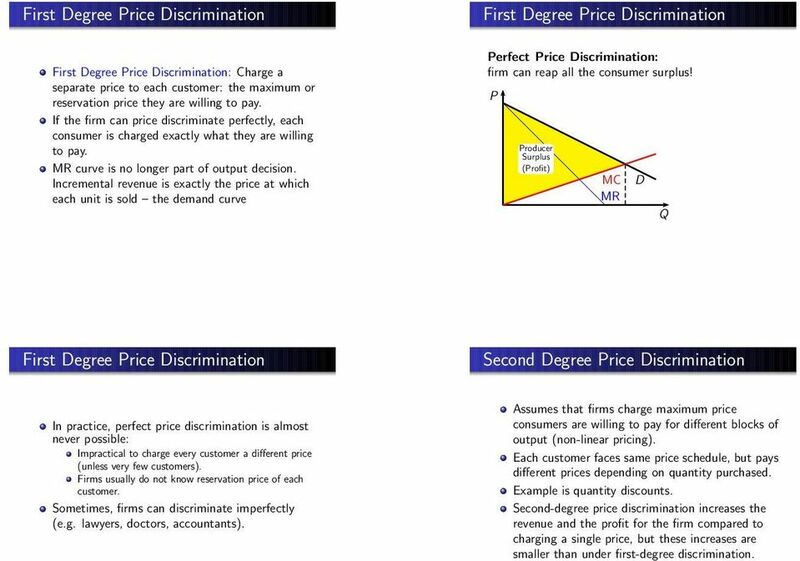 3 First Degree Price Discrimination First Degree Price Discrimination: Charge a separate price to each customer: the maximum or reservation price they are willing to pay. If the firm can price discriminate perfectly, each consumer is charged exactly what they are willing to pay. MR curve is no longer part of output decision. Incremental revenue is exactly the price at which each unit is sold the demand curve First Degree Price Discrimination Perfect Price Discrimination: firm can reap all the consumer surplus! 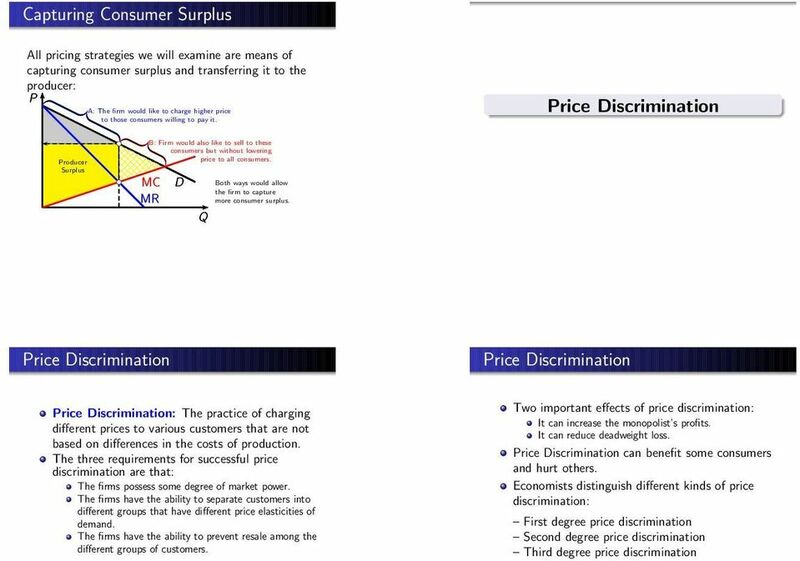 P Producer Surplus (Profit) MR D Q First Degree Price Discrimination Second Degree Price Discrimination In practice, perfect price discrimination is almost never possible: Impractical to charge every customer a different price (unless very few customers). Firms usually do not know reservation price of each customer. Sometimes, firms can discriminate imperfectly (e.g. lawyers, doctors, accountants). Assumes that firms charge maximum price consumers are willing to pay for different blocks of output (non-linear pricing). Each customer faces same price schedule, but pays different prices depending on quantity purchased. Example is quantity discounts. Second-degree price discrimination increases the revenue and the profit for the firm compared to charging a single price, but these increases are smaller than under first-degree discrimination. 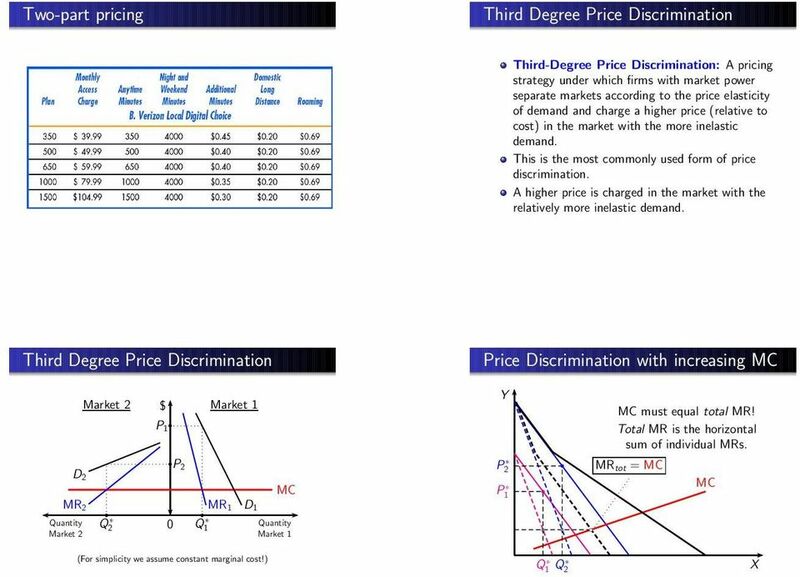 4 Second Degree Price Discrimination Two-part pricing Second Degree Price Discrimination: Quantity discounts can increase producer surplus. 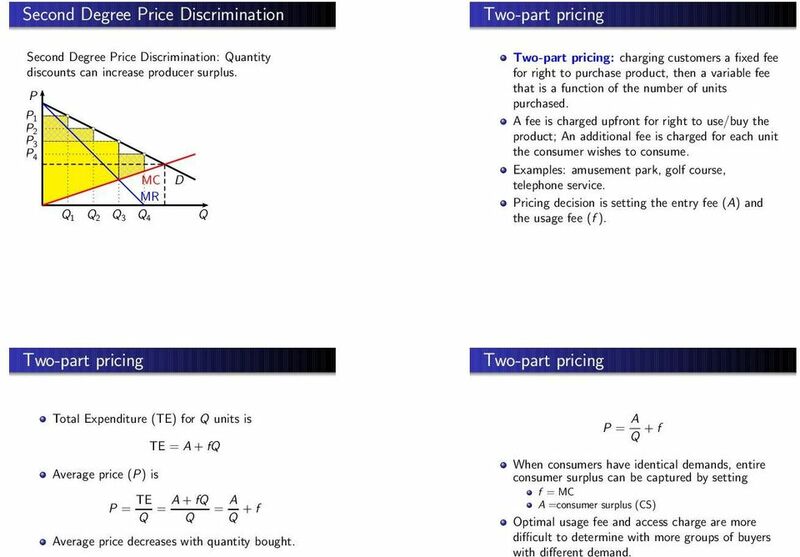 P P1 P2 P3 P4 Q1 Q2 Q3 MR Q4 D Q Two-part pricing: charging customers a fixed fee for right to purchase product, then a variable fee that is a function of the number of units purchased. A fee is charged upfront for right to use/buy the product; An additional fee is charged for each unit the consumer wishes to consume. Examples: amusement park, golf course, telephone service. Pricing decision is setting the entry fee (A) and the usage fee (f). Two-part pricing Two-part pricing Total Expenditure (TE) for Q units is TE = A+fQ Average price (P) is P = TE Q = A+fQ = A Q Q +f Average price decreases with quantity bought. 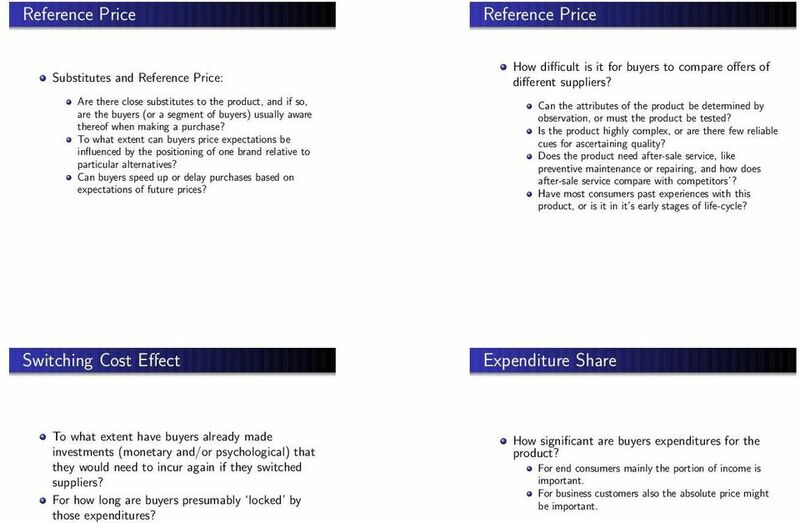 P = A Q +f When consumers have identical demands, entire consumer surplus can be captured by setting f = A =consumer surplus (CS) Optimal usage fee and access charge are more difficult to determine with more groups of buyers with different demand. 6 Third Degree Price Discrimination Coupons and Rebates Examples: College students and senior citizens are not usually willing to pay as much as others because of lower incomes. These groups are easily distinguishable with ID s. Price reductions for locals in ski resorts Locals are easily distinguishable by their dialect. Hardback vs. paperback books: Company divides consumers into two groups: Those willing to buy the more expensive hardback and those willing to wait for the paperback. Publishers typically wait 12 to 18 months Those consumers who are more price elastic will tend to use the coupon/rebate more often when they purchase the product than those consumers with a less elastic demand. Coupons and rebate programs allow firms to price discriminate. About 20 30% of consumers in the USA use coupons or rebates. Firms can get those with higher elasticities of demand to purchase the good who would not normally buy it. 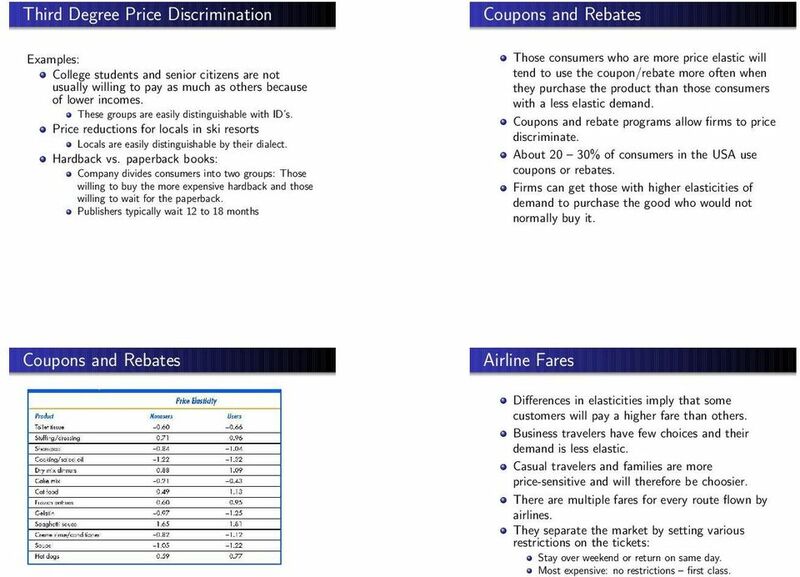 Coupons and Rebates Airline Fares Differences in elasticities imply that some customers will pay a higher fare than others. Business travelers have few choices and their demand is less elastic. Casual travelers and families are more price-sensitive and will therefore be choosier. There are multiple fares for every route flown by airlines. They separate the market by setting various restrictions on the tickets: Stay over weekend or return on same day. Most expensive: no restrictions first class. 7 Bundling Bundling Bundling: where products are sold separately but also as a bundle which is less than the sum of prices as if they had been sold individually. Conditions necessary for bundling: Heterogeneous customers. Price discrimination is not possible. Demands must be negatively correlated. Examples: Microsoft, restaurants, car purchasing, vacation travel,... Tying Tying: The practice of requiring a customer to purchase one good in order to purchase another. Examples: Printer & ink Nespresso Allows firm to meter demand and practice price discrimination more effectively. 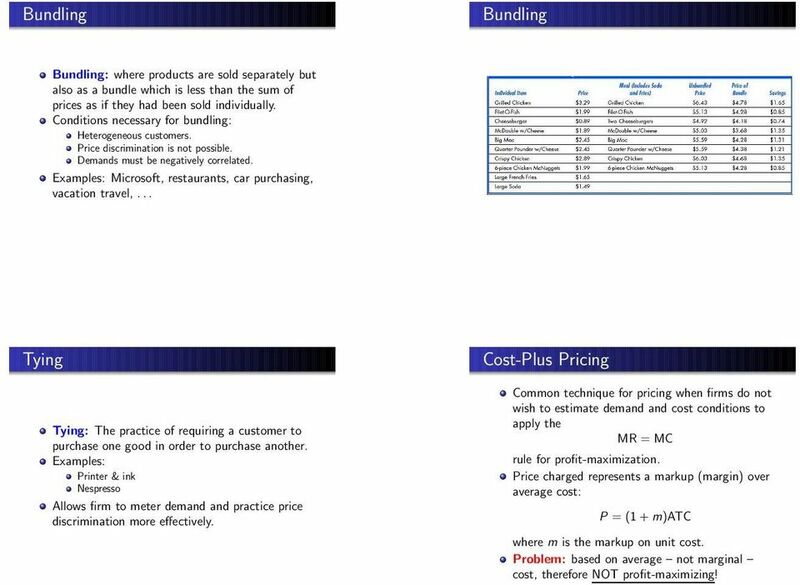 Cost-Plus Pricing Common technique for pricing when firms do not wish to estimate demand and cost conditions to apply the MR = rule for profit-maximization. Price charged represents a markup (margin) over average cost: P = (1+m)ATC where m is the markup on unit cost. Problem: based on average not marginal cost, therefore NOT profit-maximizing! 9 Reference Price Reference Price Substitutes and Reference Price: Are there close substitutes to the product, and if so, are the buyers (or a segment of buyers) usually aware thereof when making a purchase? To what extent can buyers price expectations be influenced by the positioning of one brand relative to particular alternatives? Can buyers speed up or delay purchases based on expectations of future prices? How difficult is it for buyers to compare offers of different suppliers? Can the attributes of the product be determined by observation, or must the product be tested? Is the product highly complex, or are there few reliable cues for ascertaining quality? Does the product need after-sale service, like preventive maintenance or repairing, and how does after-sale service compare with competitors? Have most consumers past experiences with this product, or is it in it s early stages of life-cycle? Switching Cost Effect Expenditure Share To what extent have buyers already made investments (monetary and/or psychological) that they would need to incur again if they switched suppliers? For how long are buyers presumably locked by those expenditures? How significant are buyers expenditures for the product? For end consumers mainly the portion of income is important. For business customers also the absolute price might be important. 10 End-Benefit Fairness What end-benefit do buyers seek from the product? (e.g. fishing fishing rod). How price sensitive are buyers to the cost of the end benefit? What proportion of the end benefit does the price of the product account for? Does the customer pay the full cost of the product, or is it e.g. deductible from tax? Buyers are more sensitive to a product s price when it is outside the range that they perceive as fair or reasonable. How does the current price compare with prices people have paid in the past? What do buyers expect to pay for similar products? Do customers perceive the product as necessity or as a discretionary purchase? 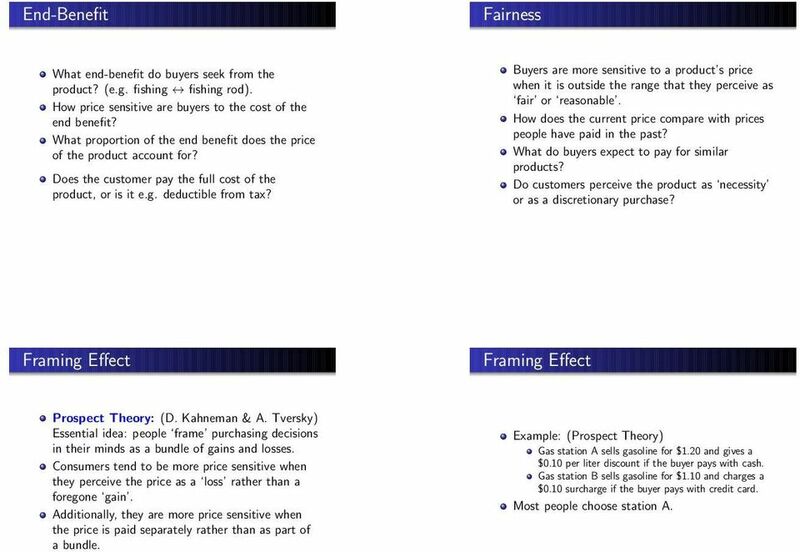 Framing Effect Framing Effect Prospect Theory: (D. Kahneman & A. Tversky) Essential idea: people frame purchasing decisions in their minds as a bundle of gains and losses. Consumers tend to be more price sensitive when they perceive the price as a loss rather than a foregone gain. Additionally, they are more price sensitive when the price is paid separately rather than as part of a bundle. Example: (Prospect Theory) Gas station A sells gasoline for $1.20 and gives a $0.10 per liter discount if the buyer pays with cash. Gas station B sells gasoline for $1.10 and charges a $0.10 surcharge if the buyer pays with credit card. Most people choose station A. Because of inherent tradeoffs between marketing mix elements, pricing will depend on other product, distribution, and promotion decisions.